Every walk of life can be found here, from starving artists to blue collar mill workers to professors and doctors. Overall the vibe is very relaxed and unpretentious, with a roll-up-your-sleeves community spirit that goes back generations in Nanaimo. 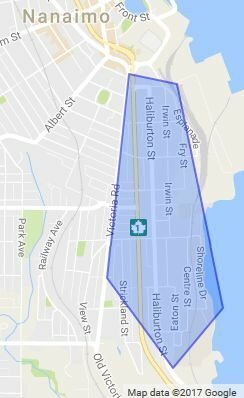 This is a very large and diverse area, and I wouldn't have listed it all together on one page if the Vancouver Island Real Estate Board didn't include it as a single region. So, I've broken down the distinctions here, with a pre-set search for each area. Remember, if you want to get notifications when new listings hit the market in any area, just find the "save this search" button and use it! 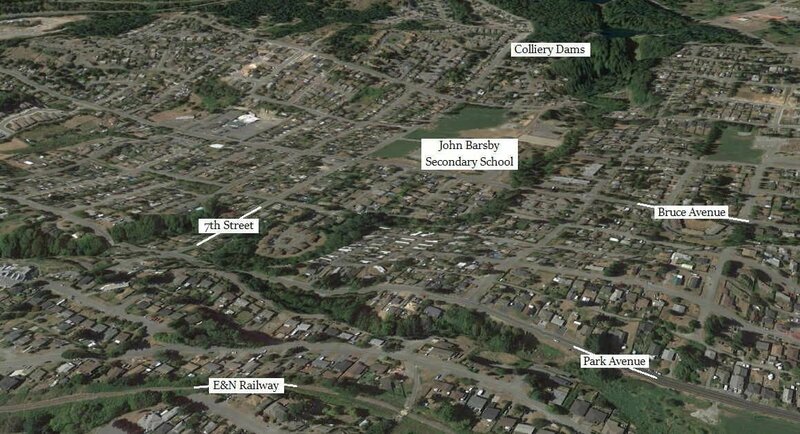 This is the largest homogeneous part of South Nanaimo - it's a wide plain of about 3.25 km² between the railway and VIU, between 4th St and 10th St.
Harewood is very convenient to downtown and both highways, as well as being snug against the wilderness behind town. This is a charming and relaxed neighbourhood - and it's old - it was a rural district with its own municipality prior to its annexation by Nanaimo in 1976. When this area was first settled as land for the coal miners and their families in the late Victorian/Edwardian eras, it was subdivided as five-acre plots (it's also called "Five Acres"). Over time, these plots were subdivided and newer homes (1920's craftsman bungalows to post-war ranchers and split-levels), were added beside them. This is a great place to find a well-made home of solid wooden construction. There used to be a lot of old-growth fir available in these parts, and it shows. This is a quiet area with some nice homes, set apart somewhat from the bustle and hustlers of the South End (see below) yet not quite falling into Harewood. There are old character homes, as well as mid-late 20th century boxes and everything in between. In old Nanaimo, this was part of the "South Ward" - a distinct community with its own teams - holding rivalries with other downtown neighbourhoods. A lot of renovated miners' cabins and sumptuous Victorian homes still remain, overlooking the harbour and the estuary. Despite what I've written below, I have to acknowledge that at least half of all the properties in the South End are lovingly cared for and are very desirable for their period architecture and/or mature yard spaces. This is SLOWLY emerging as a great real estate investment area in Nanaimo. It was the roughest part of town for decades, but is slowly being gentrified by investment-minded buyers who see the immense potential of this oceanside location so close to downtown Nanaimo. Other buyers are people who like getting a solid craftsman home at a discount. While the north end of Haliburton has its rough patches, the south end has some very desirable real estate. This is the area near Petroglyph Park and the Calico Cat teahouse, with beautiful homes on large lots overlooking the expansive Nanaimo River Estuary. There is also a multi-family complex and a mobile home park here, but I've never checked them out. I'd love an excuse to check out the area. Let me know if you want to view a listing for sale in the area! There's been an explosion of development in this area since around 2009, and it's not slowing down. The homes are on "modern sized" lots (i.e., smaller than traditional single-family plots) which helps them to be affordable despite many of these homes having high square footage and some nice finishes. These neighbourhoods are quiet and family oriented, and so far at least, the yards are very well kept. These neighbourhoods are preferred by households who have at least one vehicle, because there are no amenities within a 12-min walk. Then again, I am told that the local Quality Foods supermarket is opening a new store at the commercial space near 9th St. and Bruce Ave., which would bring shopping much closer to the 9th/10th St neighbourhoods. Some of this area appears to be bare land strata (detached homes with a fairly simple strata agreement), but not all of it. There are also some townhomes that share the strata with the detached homes. I'm eager to learn more, so please call me if you're wanting to view a home in this area. I'd love to work with you. Park Avenue Elementary ; 395 Eighth St.
Bayview Elementary ; 140 View St.